Profile view of an Abia sp. sawfly. Is it a wasp? Is it a bee? No, wait, could it be…an elaborate moth mimicking one of those? Actually, also no. Instead what we have is a sawfly. I was pretty stumped, but one day a Flickr contact happened to post a photo of a very similar insect. I believe this is an Abia sp., maybe A. inflata or A. ionicerae. 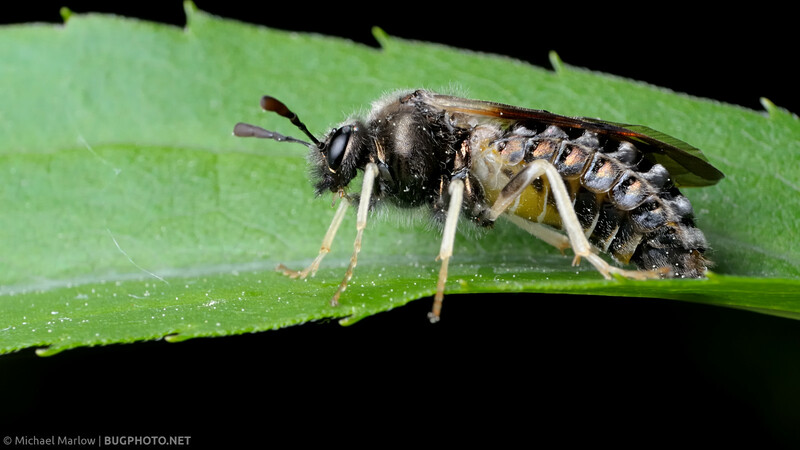 For those unfamiliar, a sawfly is a member of Order Hymenoptera, the group that also includes wasps, bees, and ants. Unlike wasps and bees, sawflies are thick-waisted; they do not have a pedicel “waist”, i.e. a thin stem-like structure connecting the thorax and abdomen. The head on this one, I believe, is what threw me off; in my experience they are more wasp-like, less hairy. Posted in SawfliesTagged Abia, Cimbicidae, insect photography, Macro Photography, not a wasp, sawfly, SymphytaBookmark the permalink. Cracking photo, great detail. Yes these have stumped me a few times.